Naild' It Unique Polish Part One! This week, I've got five polishes from the wonderful Andrea of Naild'It Unique Polish to share with you, readers! You might remember back when I got my first Naild'It polish, "Leg O No Way Yo." 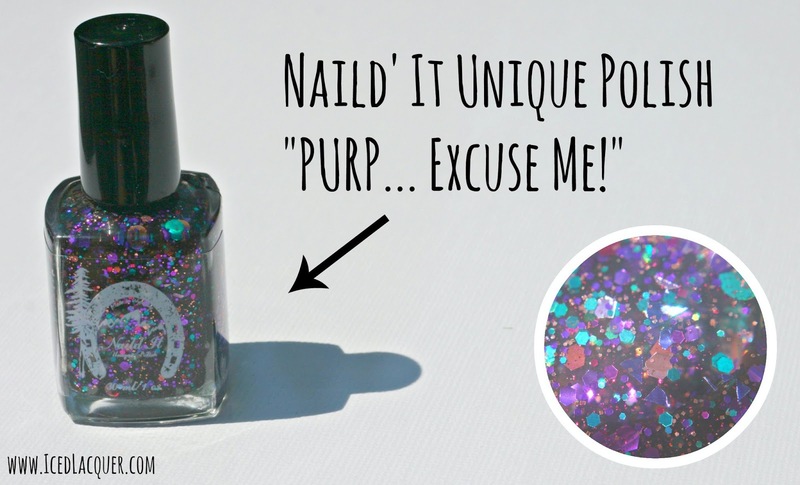 I was bouncing off the walls with excitement when I finally got my hands on that polish! Well, I had pretty much the same reaction when I opened my package this time! 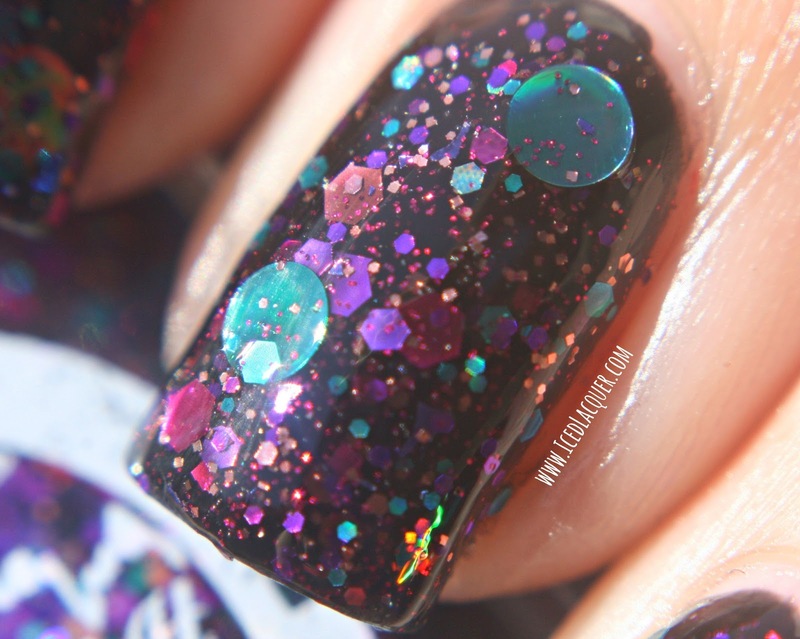 The first one I want to review is the glitter-bomb, "PURP... Excuse Me!" (Haha doesn't she have the best polish names?) When I first opened this, I gently peeled back the bubble wrap and just stared at this bottle in awe. Holographic glitter hexes, squares, shards, and mega circles in two of my favorite colors, purple and aqua, swimming in a dark jelly base. That's my idea of a perfect polish right there. I chose to layer this over one coat of Sally Hansen "Black Out." I have no doubt that this polish could be built to opacity, but I REALLY wanted some of those huge circles to stand out on the black base. Application was fairly easy with this one. I did have to do a couple of extra dips to get as many circles out as I did, but it was by no means difficult to get them out. This shows one thick coat with a little bit of dabbing to fill in any spots I felt like needed more. I topped it with two coats of Seche Vite. Ahh, isn't it just magical? I love how the tiny glitters float over the big circles. So there it is! What do you think? I'm certainly in love! I'll be posting the other shades throughout the rest of the week, so make sure you check back soon! You can stay up to date with news and release dates on Facebook or check out the Etsy store, which has additional information on where to purchase some bottles of your own! It is gorgeous!! How long did it last? Thank you! I'm afraid I can't give an accurate wear time with this one, as I used a glue base coat to make swatching several polishes easier. I have a feeling that it would be pretty long lasting as it's so packed with glitter that it would make it a tad more resilient to chipping!